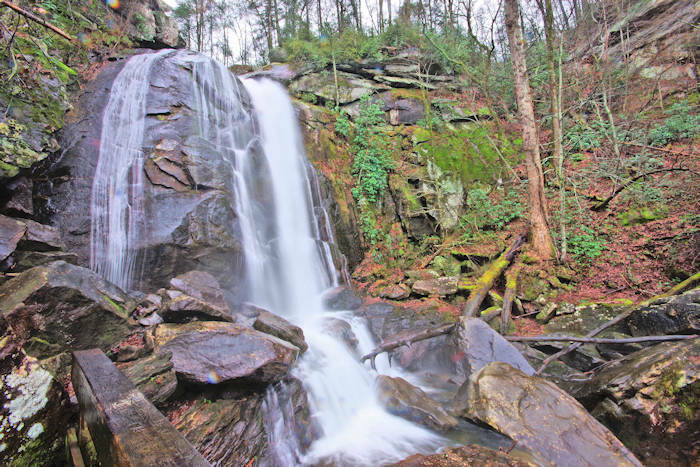 The hike to High Shoals Falls is one of the most scenic in western North Carolina. 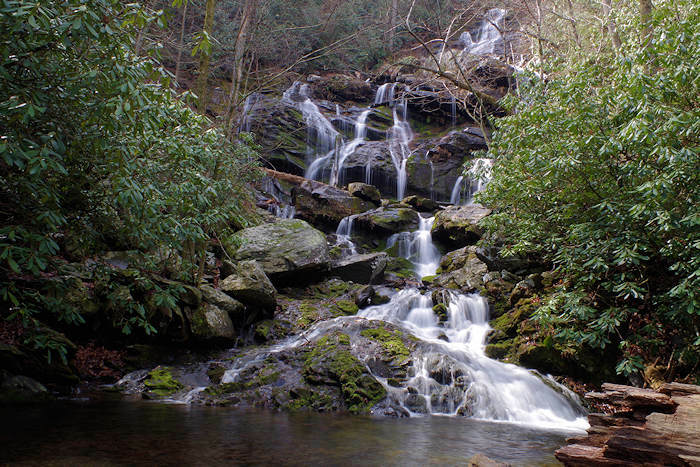 It's located in South Mountains State Park, south of Morganton (about 70 miles east of Asheville). 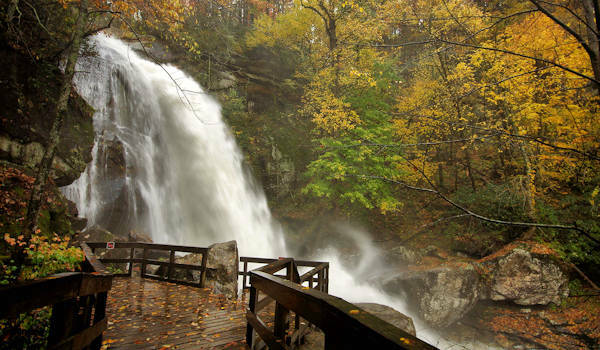 You have two options: hike one mile to the 60-foot waterfall and return (for two miles total). Or hike the 2.7-mile loop which includes a short section of stair climbing. 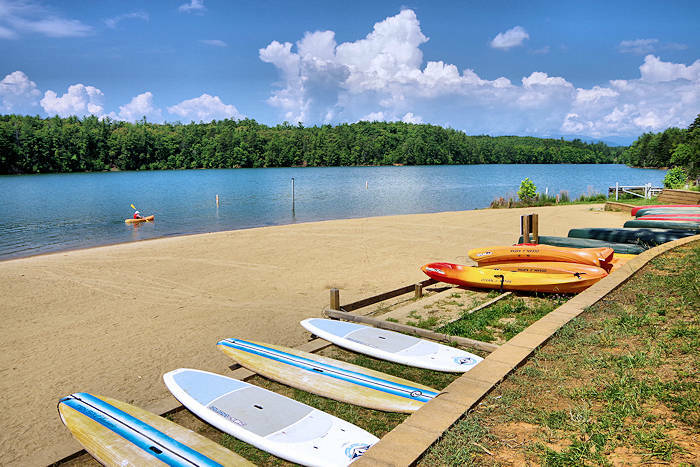 The hike begins at the Jacob Fork parking area with picnic area and restrooms. The park campground is nearby. The trailhead is well marked. The first half mile of the hike is an easy stroll along the cascading Jacob Fork River. The last half of mile of your trek to the waterfall is even more scenic as you meander by cliffs, through rhododendron forest and across a boardwalk above river cascades. 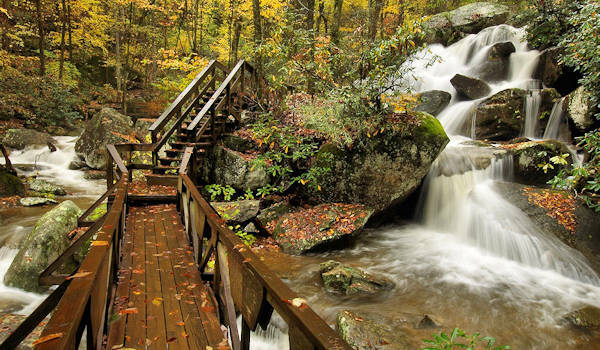 While the boardwalk section and final climb to the waterfall observations deck are spectacular any time of year, you should try it after a good rain. 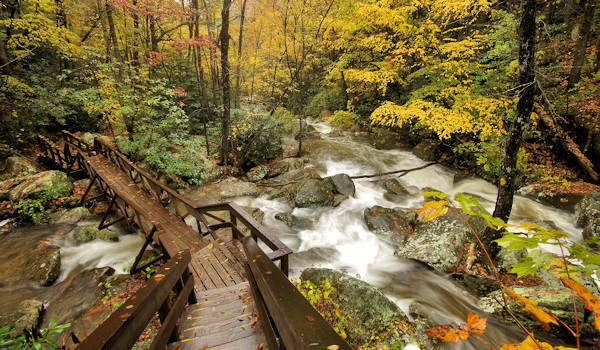 The sounds and sights of the rushing water makes this one of our favorite hikes anywhere. 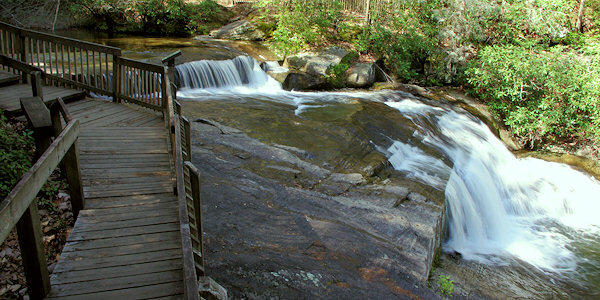 Past the boardwalk, you will walk up a steep section of steps to reach an observation deck right beside High Shoals Falls (pic above during high water). Just before you reach the deck, the loop trail forks off to the left. If you want to complete the loop, you'll climb more steps to reach the top of the waterfall. The trail continues across a ridge, past backcountry camping areas and rejoins the trail near the river. On the way back, be sure to take the Hemlock Nature Trail that runs right by the river (and roughly parallel to the main trail) with more views of the river and great educational signs along the way. Free admission. Read much more about South Mountains State Park. Located about 17 miles south of I-40. 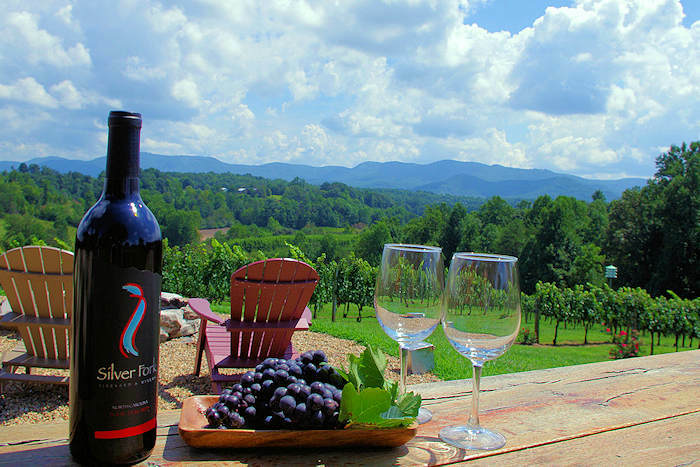 Coming from Asheville, take exit 104 for Enola Road and turn right. Drive 6.7 miles on Enola Road to Old NC 18 and turn right. Drive 5.2 miles to Ward Gap Road and turn right. Drive 1.4 miles to S Mountain Park Road and turn right. Drive about 3.5 miles to trailhead parking.